The Summer holidays are here – although you wouldn’t know it from the weather this week here in Hampshire – and that means in order to keep the boys from squabbling every minute they’re awake and either slightly hungry, thirsty, or any other reason they can come up with to be bickering at the moment, we’re staying active. We love garden games and this week we’ve been sent two – both variations on games I played when I was little! The first one we opened was called Wobbly Worm and it’s so much fun. Initially the fun had to be put on hold as it required some AA batteries which seemed to be the only kind we don’t have any of, but once we got the batteries we were away. 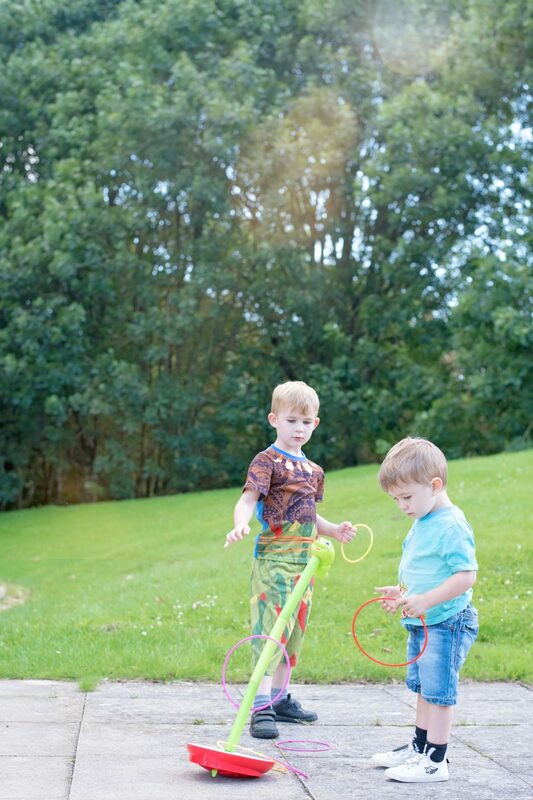 Wobbly Worm is a modern-day, super tall quoits [or hoopla if you’re Daddy Pig] which builds on gross motor skills for little ones, and sends you back to your own childhood if you’re a grown up! The base is a sweetly themed half apple, and wobbly worm pokes up from the centre. He’s constructed by connecting tubes together so that the height can be adjusted to three different heights [good for little Hero who isn’t quite as tall as his big brothers] and when the batteries are turned on, he rotates and wobbles quite noisily [but then, everything in our house is noisy, I barely notice these days] whilst everyone tries to throw a hoop over him. The hoops themselves have a safety feature built in – they can be snapped apart and so anyone hooked “accidentally” [read: lassoed] by a hoop can break free without hurting themselves, which is fantastic news for those of us whose children love to see whether they can fit their head through a variety of spaces that they shouldn’t, much like Norman Price in Fireman Sam. Wobbly Worm has given us lots of fun – and improved our aims quite a bit too!